1. Eliminating or drastically reducing consumer debt, in the form of credit cards, retail stores’ charge cards, etc., often has as much to do with changing your life as it does with simply paying your debts. Photographers are just as vulnerable as anyone to this problem, but carrying too much debt when you are trying to start or operate a photography business can become a large barrier to growth and long-term success. 2. The first reality you must be willing to face is that you are in debt. An “it’s-no-big-deal, I-can-manage-it just-fine” attitude is psychological denial is simply a crutch to avoid a problem you don’t want to admit or solve. 3. Create a document, use a spreadsheet, and account for all your debt other than a home mortgage and car payment. Determine how much you owe to whom, how much total and how much interest you are paying every month and year. 4. Study your credit card statements carefully. Categorize your purchases into a few groups: Absolutely Necessary, Not Actually Necessary, Entertainment, Honest Family Expenses, etc. For example, if you’re buying an expensive latté every month with a credit card, then you are paying a little bit of interest every month, for years potentially, for that extravagance. You may be able to afford those lattés, but buy them with a debit card or cash. 5. 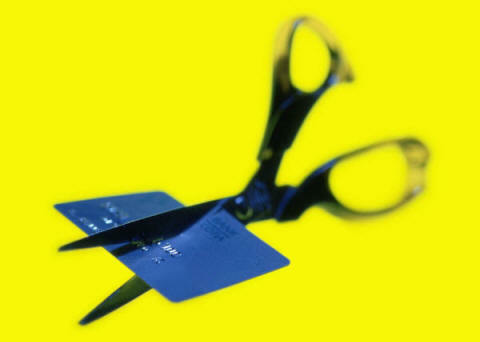 Rank your creditors by the highest interest rate, since you should try to eliminate the most costly cards first. Some debt specialists and counselor advise that you pay the minimum amounts on the cards with the lowest interest rates while you send the largest amount possible every month to the cards with the highest interest rates. 6. If your spreadsheet of your credit card purchases and fees reveals that you are regularly paying late fees, then use the digital technology your bank provides to create automatic payments that occur prior to due dates, so you can eliminate all future late fees. 7. A major reality that many people simply can’t face is to stop buying with credit while paying old debt, or to take a “vacation” from spending money on clothing, entertainment, travel or other truly non-essential expenditures. 8. Studying and categorizing your past credit-card purchases, as recommended in #4 above, will help you discover how much unnecessary “stuff” you are buying. If you purchase a particular product or service every month, then reduce this purchase to every other month. You may be surprised how little this will actually affect the quality of your life. 9. Your bank or the credit card company and independent sources on the Internet provide calculators or other systems to determine how many months you must make a specific payment to become debt free. With the information, you have more control of how much you pay, when and to what creditor, and you’ll be able to make any regular and intelligent adjustments. 10. A major reason many people find themselves with so much debt is because they don’t develop and manage a budget, as an individual, a family or a photography business. Few tools will help you more than a realistic budget to stop yourself from spending money you don’t have and increasing your debt. The Internet is filled with sources of budget spreadsheets and documents for many kinds of individuals, families and businesses. 11. Spending unnecessary money to fill your house and/or life with more “stuff” can be a deeper psychological issue, such as an obsession. A reality you may have to be willing to admit and that you need professional help. 12. For the great majority of consumers, controlling spending may be far from an obsession, but many of them need motivation to follow through on their obligations. Again, you’ll find many sources of personal development information and materials on the Internet that will support you, as you reduce your debt. 13. Everyone in your family must assume some of the responsibility for your accumulated debt and the actions to eliminate it. Make it a family activity that will teach children financial responsibility. Organize the process as a “competition,” rewarding family members that curb their expenditures, or plan a special family vacation to celebrate when your debt totally disappears. 14. Don’t hesitate to ask for professional assistance, either from your accountant for your photography business or certified debt counselors and organizations, such as Consumer Credit Counseling Services (CCCS) or DebtAdvice.org. Be wary of debt-consolidation companies that heavily advertise their services, as some of them are more interested in earning a fee than helping you reduce your debt. 15. As your debt-reduction plan and budget start to show results, work in a positive direction by creating an emergency fund and increasing your savings.